After almost two years, 28 articles (having even gone weekly last summer to coax people out more often with up-to-date positioning and flyover timings), one well-attended solar eclipse, and a short-stack of Uranus potty humor and misspelled complaints about grammar and punctuation (sorry again, Kathleen), the decision was made by Syracuse Media Group to discontinue the UNY Stargazing series featured at syracuse.com and newyorkupstate.com. Those seeking monthly astronomy content do not have to look far at all – generally speaking, there is little to differentiate the Upstate NY skies from the rest of the continental U.S. Planetary, some satellite, and various deep space observing opportunities are available for your reading and scheduling pleasure at the many sites listed on the CNYO Cheat Sheet. If you have not yet done so – I cannot recommend enough that you find and join a local astronomy club. Your membership will help keep them going, and the learning and observing opportunities will help keep you going. Note that March is the best month for planning your Messier Marathon. Be sure to check your local astronomy club to see if any events are being scheduled. 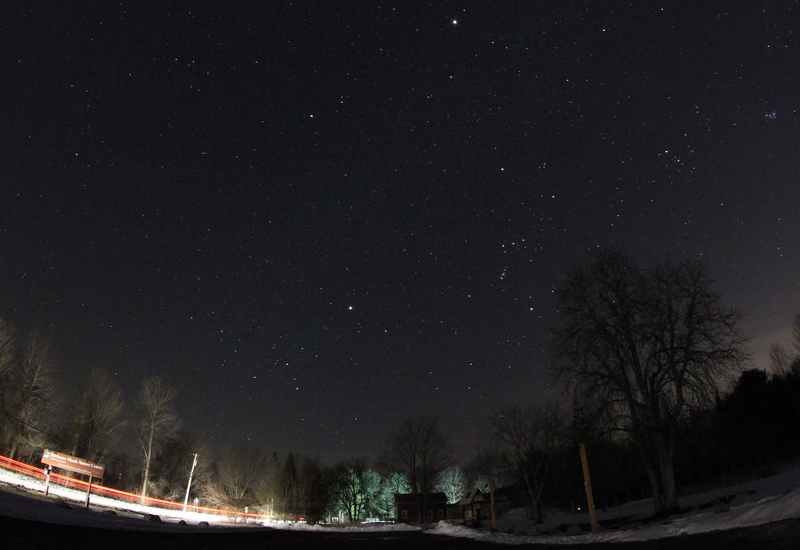 The best-of-winter constellations over Baltimore Woods in Marcellus, NY. The bright star at lower-center is Sirius in Canis Major. To its right and up, the belt of Orion, the five-star “V” of Taurus, and the Pleiades star cluster near the image edge. Photo by the author. There were a few evenings this past February that were unexpectedly comfortable for the time of year, hopefully giving observers some unexpectedly long opportunities to take in some of the busiest regions of our nighttime sky. To have the grouping of the Winter Hexagon – Orion, Taurus, Auriga, Gemini, Canis Minor, and Canis Major – out and about at such reasonable hours means that anyone can see not only the brightest grouping of bright stars in our yearly sky, but also some of the closest groups of stars. The Hyades star cluster, made up of the “V” of the head of Taurus the Bull – but not including the bright eye star Aldebaran – is our closest star cluster at 150 light years. Just to the northwest of the Hyades lies the second-closest bright cluster of stars to our Solar System – the Pleiades. If you can find the Pleiades and the patch of stars under Orion’s Belt, you can even scratch two of the 110 Messier Objects off of your list. The history and some key details of the Messier Objects were discussed in the March, 2017 article. In brief – these are the bright galaxies, star clusters, and nebulae that can all be found with little more than a quality pair of binoculars, dark skies, a good star chart, and a big cup of coffee. The time around mid-March and early-April is the only time of the year when, if you start VERY soon after sunset, you can find all 110 of these objects before sunrise the next morning. Astronomy clubs the world over often plan marathons as a group – these are great opportunities to learn from seasoned amateurs as well as to see how the same object may look in many different binoculars and telescopes. 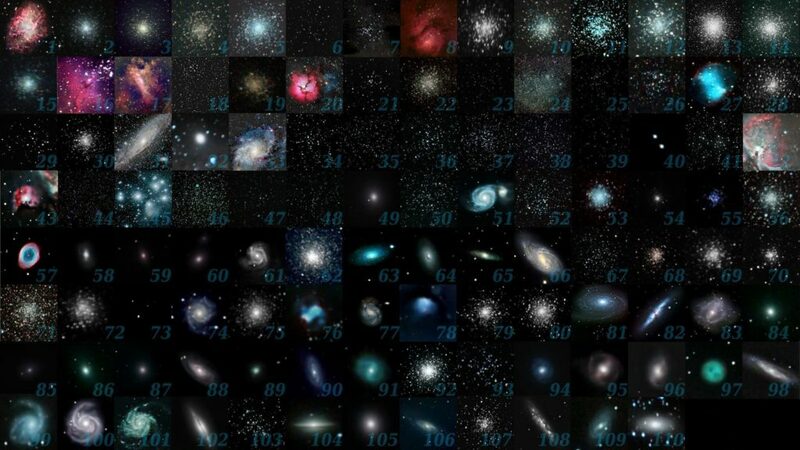 The 110 Messier Objects through highest-quality optics. 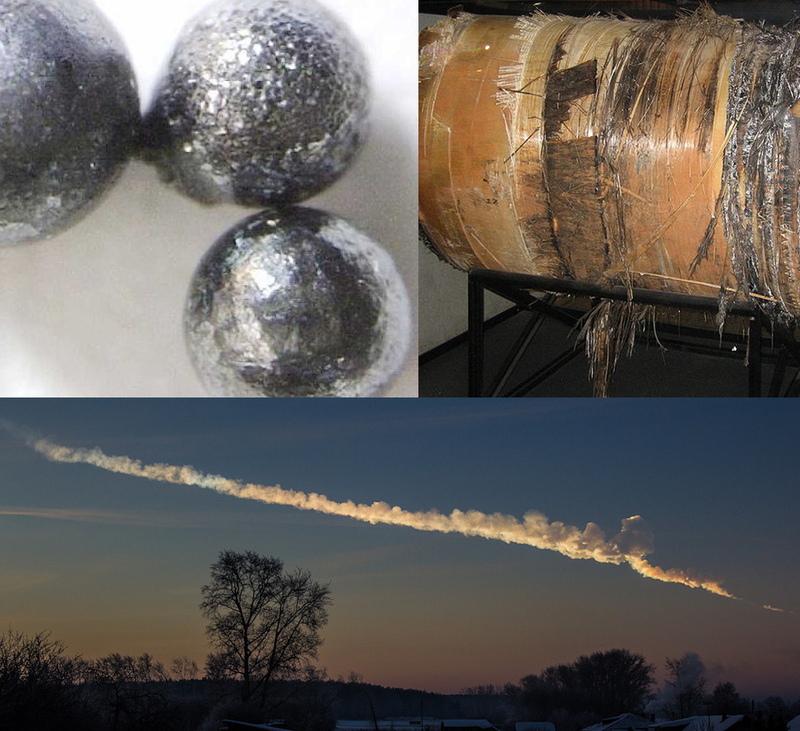 Images compiled by Michael A. Phillips.